Juvenile xanthogranuloma, General medicine, Histiocytosis Juvenile xanthogranuloma – cite! Juvenile xanthogranuloma (message) Juvenile xanthogranuloma – participate! Juvenile xanthogranulomaThis glossary term has not yet been described. Juvenile xanthogranuloma is the most common non-Langerhans cell histiocytosisThis glossary term has not yet been described. and it has a characteristic dermoscopic pattern that has been described as a ‘setting sun’. It appears as an orange-yellow area encircled by erythremic border. Other dermoscopic features include pale yellow globulesThis glossary term has not yet been described., subtle pigment networkGrid-like pattern consisting of interconnecting pigmented lines surrounding hypopigmented holes., whitish streaks, and branched linear or dotted vesselstiny pinpoint vessels. 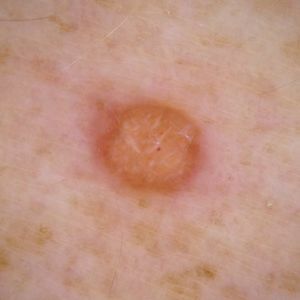 The dermoscopic features were suggested to correlate with the maturation level of the lesions. The ’setting sun’ appearance was found in early evolutionary and in fully developed lesions. In fully developed lesions, the surrounding erythema decreased and yellow globules became more evident. In late regressive lesions, prominent whitish streaks were identified. DermoscopyThe examination of [skin lesions] with a 'dermatoscope'. This traditionally consists of a magnifier (typically x10), a non-polarised light source, a transparent plate and a liquid medium between the instrument and the skin, and allows inspection of skin lesions unobstructed by skin surface reflections. Modern dermatoscopes dispense with the use of liquid medium and instead use polarised light to cancel out skin surface reflections. is helpful in differentiating juvenile xanthogranulomaThis glossary term has not yet been described. from other conditions that present as solitary yellow-orange lesions. ↑ Palmer et al. : Dermoscopic appearance of juvenile xanthogranuloma. Dermatology 2007;215:256-259. PMID: 17823526. DOI. ↑ Song et al. : Structural correlations between dermoscopic and histopathological features of juvenile xanthogranuloma. J Eur Acad Dermatol Venereol 2011;25:259-263. PMID: 20698915. DOI. This page was last modified on 29 November 2017, at 22:53.